(Newser) – Better late than never? The Swedish Academy, which selects the winners of the Nobel Prize in literature, has condemned an Iranian death warrant against British writer Salman Rushdie, 27 years after it was pronounced. Two members quit the academy in 1989 after it refused to condemn Ayatollah Ruholla Khomeini's fatwa against Rushdie for allegedly blaspheming Islam in his book The Satanic Verses. Citing its code against political involvement, the academy issued a statement defending free expression but without explicitly supporting Rushdie. 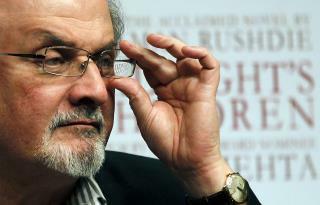 However, in a statement posted on its website Thursday, the academy for the first time denounced the fatwa and reward money for Rushdie's death as "flagrant breaches of international law," per the AP. I tried reading Rushdie's S. Verses work but found it impossible. Nobel nerds thought the same, I guess. "Its code against political involvement!" I blew my morning coffee out of my nose on that one. Once again, the left-wing hypocrites don't understand their relativistic lunacy. The left-wing has no problem prohibiting what it deems "hate speech" according to its whimsical fancies. Well, guess what a-holes, Muslims also believe that what Rushdie wrote constitutes "hate speech" and should therefore be banned. Left-wing socialists are therefore present to the world their own ridiculous "fatwas".